Midweek cooking is the bane of hardworking humans everywhere. No sweat -- each of these lunch or dinner dishes requires only four ingredients (plus basic seasonings). Easy peasy! 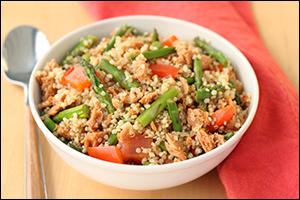 The pre-seasoned tuna is a great shortcut and makes this recipe SO delicious! In a small pot, combine quinoa with 1/2 cup water. Bring to a boil, and then reduce to a simmer. Cover and cook for 12 minutes, or until water has been absorbed and quinoa is fully cooked. Meanwhile, bring a skillet sprayed with nonstick spray to medium-high heat. Add asparagus and 1 tbsp. water. Cover and cook for 2 minutes, or until partially softened. Uncover, and add bell pepper. Cook and stir until water has evaporated and veggies have softened and lightly browned, about 4 more minutes. Transfer quinoa to a medium bowl, and season with a dash of each seasoning. Add veggies and tuna, and mix well. Serve warm or chilled. In a large bowl, combine beef, egg whites/substitute, ranch mix, 1 tbsp. hot sauce, 1/4 tsp. garlic powder, and 1/4 tsp. black pepper. Mix thoroughly. Transfer mixture to the loaf pan, and smooth out the surface. Bake until cooked through, about 50 minutes. Just before slicing, top with remaining 1 tbsp. hot sauce. 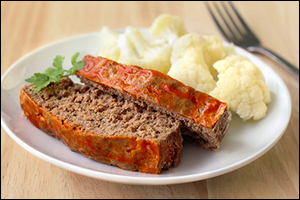 HG Alternative: If made with lean ground turkey (7% fat or less) instead of extra-lean beef, each serving will have 177 calories, 7.5g total fat (3g sat fat), 590mg sodium, 2g carbs, 0g fiber, 0.5g sugars, and 24g protein (Freestyle™ SmartPoints® value 4*; SmartPoints® value 4*). Don't keep simple (yet awesome) recipes like these to yourself... Click "Send to a Friend" now! February is National Hot Breakfast Month. Check out this recent favorite: our Cali Chicken Egg Scramble!